Teva vs Chaco: Which One Should You Buy? Let's Find Out! 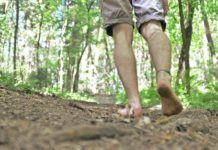 Home Hiking & Backpacking Teva vs Chaco: Which One Should You Buy? Let’s Find Out! Discovering the world is a hot – trend concept which lures loads of adventurous and dynamic youngsters. Nowadays, the young generation prefers traveling around the world and discovering the unique beauty and attractiveness of countries they went through. While traveling, owning good – quality sandals is the main concern of various people. Hence, today I write down this article to provide you with two potential candidates that will definitely meet your all requirements for a long trip, they are Teva vs Chaco. Trails and go hiking, play water games, kayaking. Awesome for rocky terrain. 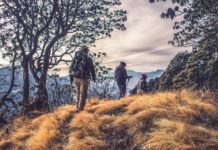 A low – quality pair of shoes will definitely drive you crazy and harm your foot when you have to go backpacking during a long day trip. Let take a glance at my featured product today – Chaco sandals. Chaco is a well – known footwear brand which provides an assortment of first-rate accessories and footwear for outdoor-minded people. Its highlight product is adjustable Z-strap sandals – also called as “Chacos”. The Iconic Z sandal was produced in 1989, through nearly 30 years of appearance in the market, it gradually wins customers’ heart and possesses a solid position in adventure lovers’ minds. Currently, Chaco sandals are available in 3 distinct editions: Classic Z, Cloud Z, and Volv Z. Unlike other sandal brands which have manufacturers in Africa and Asia countries in the purpose of declining production cost, Chacos are only manufactured in the US so you could set your mind at peace as the quality is 100% guaranteed. In general, Chaco is a great sandal brand as they allow customers to customize the strap’s color and deliver premium quality. However, the price is fairly high (ranging from $100 to $140). Figure out what kind of sandals to wear when trekking or hiking is always a frustrating step for everyone. But since I have Chaco, I don’t have to worry anymore. Its design is suitable for my liking. What I like about Chaco is that it provides a variety of styles to fit everyone’s demand and each version was produced for a particular purpose. For instance, the Z sandal collection has 3 editions: the Classic Z, the Cloud Z, and the Volv Z. Specifically, the classics have a simple and super durable design; you could easily see them in every store as they are the most common sandals. Their biggest disadvantage is their heavyweight. To overcome this drawback, the Chaco launched the Volv Z models which are 20% lighter compared to the old version. The Volv Z is a better option if you don’t take part in adventurous activities as they are less durable compared to the Classics. The last one which is my favorite model is the Cloud Z. If you are too tired of feeling extreme pain after hiking when making use of other poor – quality sandals, just give this one a try, and I’m pretty sure that they will comfort you immediately. In general, I think the durable sole and the thick are common features of all Chaco footwear as they are designed to conquer harsh terrains. All Chaco sandals own a specific strap pattern. There are loads of strap style options for you to choose from the single to double strap models. In addition, for the supreme durability, Chaco straps pass through the sandals’ sole in a constant loop. Even though this feature is pretty peculiar to some, it delivers great adjustability. Chaco footwear is made with good – quality materials that could stay good for years of use and Chaco sandals are unexceptional. All pair of Chacos was designed greatly to provide customers with comfortable and light steps. Hence, Chacos are usually chosen for hiking through lumpy terrains. With the non – slip footbeds, Chacos are always the best choice for water sports and activities. 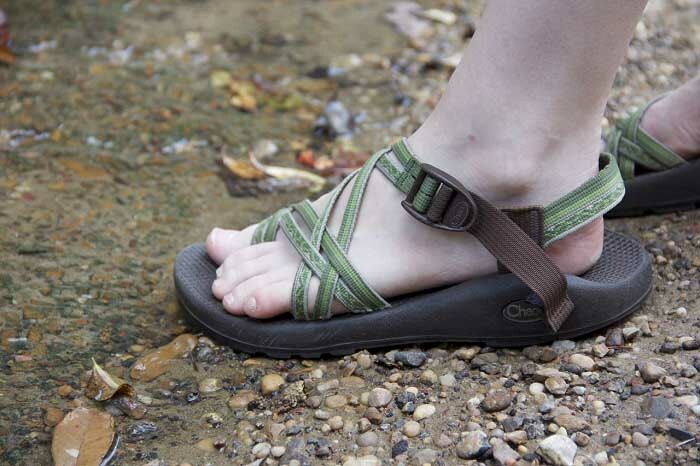 Last but not least, Chacos could morph and give you a unique footbed. In spite of the pretty long break – in period, your sandals will absolutely end up with complete comfort and long durability. In addition, Chacos are not equipped Velcro system which could wear out anytime. What is more, Chacos offer excellent customer service; I bet that you would love their repair policy. In case your sandals are broken, you could take them to the nearest store and get repaired without additional cost. 1. Are chacos good for hike in? They are extremely perfect for hiking as their design is specially made for the hiking lovers. Their long durability, excellent alignment, and the arch support will definitely pamper your foot and give your foot a sense of comfort and relax. I made use of them several times to go thru – hiking with my friends and I don’t feel pain or weary. 2. Are chacos true to size? According to my experience, they provide proper sizes as other high – end products in the market. In my first only order, I’m fairly afraid that it couldn’t fit my size as several reviewers mentioned. However, I ordered a size 9.5, and it fit well. 3. Are chacos worth it? Personally, I think they are worth purchasing as they are undoubtedly the most comfortable sandals that I have experienced in years. In addition, their design fits my liking, and the price is fairly lovely. If I’m in need of new sandals, I will definitely go for Chaco. If you are in a huge need of a fine pair of sandal for your daily walking, I would love to recommend Tevas – a super lightweight and high – quality sandal brand in the market. Teva is a well – known footwear brand that provides a variety of products such as casual shoes, flip flops, fashionable sandals for women, men and kids. It is a beloved brand for outdoor lovers, travelers, and adventures all around the world. Currently, they have several sandal collections named Hurricane, Terra, Kayenta, ALP, Sirra, Verra and Kayenta. In general, they provide a bunch of models with various colors and designs so the customers could easily choose the one fit their taste. Also, the price of Teva sandals is ranging from 70$ to 110$ which could fit everyone’s pocket. I made use of Chaco before Teva. Hence, I think Teva possesses a more typical design compared to Chaco. They are casual looking as they come with thin soles and Velcro straps. If you are keen on convenience, I guess that you’ll be appealed immediately by Teva’s sandal designs. Teva provides all types of footwear that you could make use for water activities and basic outdoor use. Moreover, they also offer more casual products including flip flops and shoes. In my point of view, Teva Hurricane and Teva Original sandal are two bright stars of this brand in sandal category. I have 2 pairs of Teva sandals that I make use for camping, walking around the park near my house and short day hikes. I love to use them for water activities as they dry out pretty quick. For me, Tevas are only suitable for casual hiker due to their thin soles, lightweight design, and low durability. If you walk through bumpy terrain, your feet will absolutely feel the rocks beneath. Unlike Chaco, Tevas only take up a few days to break – in. Furthermore, I also love it's easy – to – remove straps. Plus, Tevas’ footbed is much softer than other competitors which makes them a proper sandal for those who are backpacking for a quite long day. However, in case you don’t wear socks, they could give you blood blister during your hike. Finally yet importantly, adjusting Tevas straps is not as time – consuming as adjusting Chaco straps. 1. Are all Tevas waterproof? I’m not really sure whether all tevas are waterproof. But here are the best waterproof Tevas sandals: Hurricane XLT 2, Tera FI 4, Terra – Float Universal Lite and Sirra. If you are looking for a waterproof pair of sandals to use for water sports, these products above will never let you down. 2. Are Tevas true to size? I think it is a bit bigger than other sandal brands’ size. My size is 9.5 and when I order the 9.5 – size Sirra sandal, my feet didn’t fit the sandal at all, and I experience the heel slippage as the Sirra is a bit larger than my feet. 3. Are Tevas good for flat feet? Yes, Tevas are highly suitable for flat feet. There is no sharp-tongued when saying that they are better than others sandal brands for flat feet. In specific, Teva original sandal and Teva hurricane are always the best choice for your flat feet. 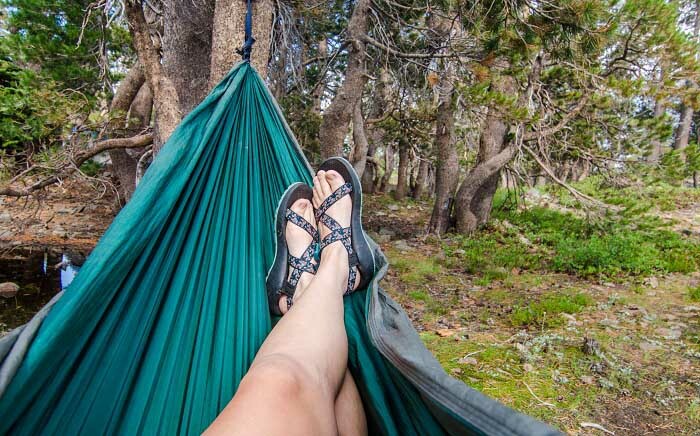 Chaco vs Teva: Which Is A Better Choice? It is a quite tough question to answer as each brand has its advantages and disadvantages. For me, Chaco and Teva are both great, but they are great for each use. So if you ask me whether buy Chaco or Teva if you are on a budget, so the answer is that it depends on which situation you use it. If you tend to use them for walking around town or go backpacking let’s opt for Tevas as it is super lightweight, comfortable and easy – to – use. If you need a high – quality and durable pair of sandals which could conquer all uneven and lumpy terrains, Chaco will be the best. In addition, if you usually do kayaking, boating, you should go for Chacos because of their better grip. In short, owing both Chaco and Teva is the best option (just approximately $300) as you could make use of them in different situations. In conclusion, I’m a big fan of both Chaco and Teva due to their outstanding features they offer. Every garden has its weeds, Chaco and Teva are unexceptional. 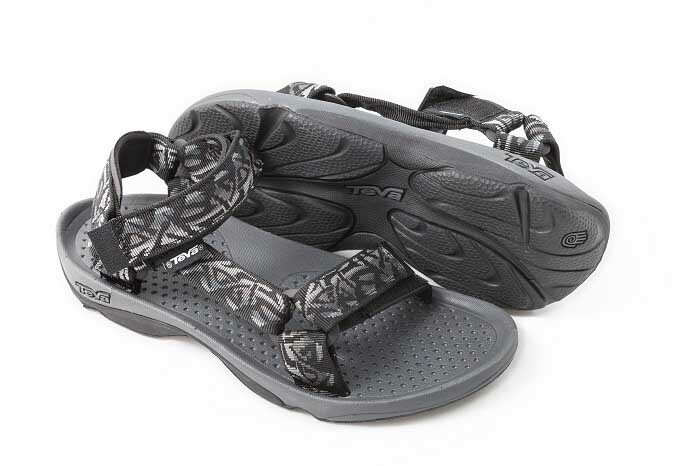 Tevas are super lightweight, budget-friendly, fast drying straps and microbial footbed. Hence, they are highly suitable for walking, camping, and short hiking. Regarding Chaco, their undeniably long durability, fully adjustable straps and brilliant arch support will absolutely amaze you and provide you the best hiking walks ever. Hopefully, after reading my article, you could grasp some useful information about Chaco Vs Teva and choose the most well – suited sandals which fit your demand and liking. Don’t forget to like and subscribe to my blog to effortlessly catch up other interesting content. And don’t forget to comment down below your thought and experience when making use of this product. If you have any question, don’t hesitate to comment. I highly appreciate all your comments, and I will reply as soon as possible. 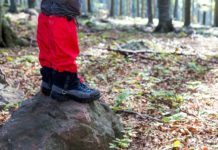 Previous articleWhat Are Gaiters and Is It A Must-Have Item For Hikers? Let’s Find Out!